Clint Eastwood is a master at a grim stare and here in Gran Torino he takes his nasty grimace to a new high. Gran Torino is a wonderful tale of an old man stuck in his ways and beliefs until he takes a protective role over a asian family living next door to him. 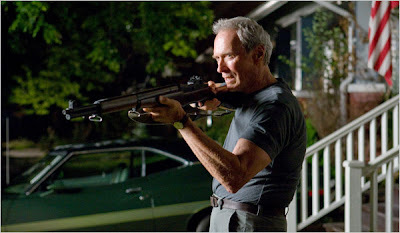 Eastwood's performance throughout Gran Torino is appalling, provocative and most of all masterful. I'm a big Danny Boyle fan, but more so a fan of quality storytelling and Slumdog Millionaire is a true testament of superior storytelling. Too many film have tried to give a story near the ending and piece it back together and failed, but Boyle's gripping drama is not one of them. Slumdog Millionaire is a film I instantly fell in love with in every way. The characters, the music, the cinematography and of course the heartbreaking story. While many have found the movie to not be uplifting, I argue that it gives us an tragic yet inspiring story of hope. While there are far more gut wrenching moments in Slumdog Millionaire than happy, the overall result is heartwarming. Boyle deserves a ton of credit for his ability to find such a large cast that spanned a massive array of ages. All of the selected actors are perfect throughout Slumdog Millionaire. Music alone is not really a reason to love a film, but The Wackness makes a real strong case. The drama is set in the summer of 1994 and houses one of the best hip-hop soundtracks of the last decade hands down. The story is fairly simplistic following a NY pot dealer who schemes for a relationship with his therapist's stepdaughter. It is the performances by Ben Kingsley, Josh Peck and Olivia Thirlby plus the dialogue penned by director Jonathan Levine that help to make The Wackness one of the best films in 2008. The best written film in 2008 is In Bruges without a doubt. The dialogue throughout the film is flawless. 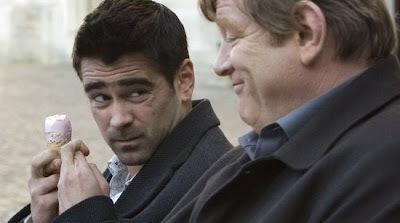 What makes the film all the more better is stupendous performances by Colin Farrell, Brendan Gleeson and Ralph Fiennes. In Bruges is a film that I can watch anytime from any point and still enjoy it just as much. One of the bigger jokes about the film is the setting itself and any viewer is hard pressed not to be swept away by the stunning scenery in Bruges, let alone the outstanding climax throughout the cobblestone streets. Writer/director Martin McDonagh proves with In Bruges that he is a filmmaker to watch out for in the future. The best vampire movie of the year and of the last decade is Let the Right One In. Like all the best vampire films before it, at the heart of the film is a love story. What is different here is that the love takes place between a young boy and what seems to be a young girl. Director Tomas Alfredson does a magnificent job with John Ajvide Lindqvist's original screenplay and so does his actors which play the slow burn of a thriller wonderfully. 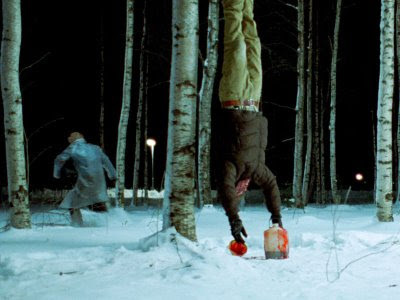 Let the Right One In is subtle and electrifying at the same time, it is a true masterpiece. Mickey Rourke returns to form in one of the most touching retrospectives on the career of a once professional wrestler. The Wrestler is a very quiet film that excels in its stirring performances by Rourke and Marisa Tomei. The movie is in the character of Randy 'The Ram' played by Mickey Rourke. Rourke is absolute in the role. Rourke delivers some of the most touching moments on screen in quite some time. Darren Aronofsky's The Wrestler is easily one of the best films of the year and most memorable. I am a epic Sam Rockwell fan and in Snow Angels he delivers one of his best performances to date. Seriously, Sam Rockwell can do no wrong, he could read the Yellow Pages and I'd be entertained. A vastly under exposed film in 2008, Snow Angels focuses on a recently divorced couple who tragically lose their daughter. Rockwell and Kate Beckinsale are hypnotizing throughout. The film also houses a touching budding love story between two teens fantastically played by Olivia Thirlby and Michael Angarano. Director David Gordon Green's Snow Angels is devastating film being a father, but is easily one of the best films in 2008. Iron Man has always been one of my favorite Marvel heroes. Mainly because he is not a superhero, but instead a brilliant man who used his talents to become a hero. 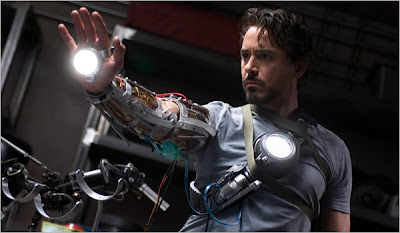 Iron Man the movie was one of my most anticipated films in 2008 and proved to be one of the best as well. Director Jon Favreau did a knock-out job with introducing the Iron Man character and his origin to the masses. The action adventure is throughly entertaining and one of my most repeatedly watched movies since its release. Let's not forget about Robert Downey Jr. who embodies Tony Stark to the letter. Absolutely flawless. I love Iron Man and can't wait for the sequel! Never in my wildest imagination did I think I would fall as in love with The Curious Case of Benjamin Button as I did. Prior to it releasing, it did not look to be something that I was going to really get behind, but irregardless of my initial thoughts, I was swept away by the David Fincher story. The fantasy drama is in every sense of the word an epic journey. There is a lot to love about the film, but first and foremost is the engaging love story. I am fascinated by the idea of two individuals reuniting throughout their lifetime. 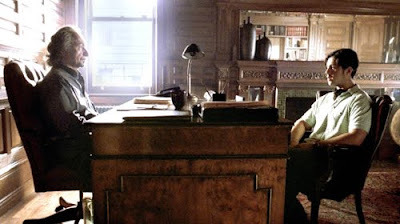 Secondly the CGI utilized to create the reverse aging on Benjamin Button. Simply captivating. Another aspect to the epic is the wide array of quality characters. Everyone cast throughout the film is perfect and help to make the journey all the more enjoyable. The pinnacle of comic book movie making is The Dark Knight. Christopher Nolan hit this one way out of the park and then some. Now I have a huge bias. Batman is bar none my favorite comic book hero. For many of the same reason's I love Marvel's Iron Man, Batman and I are close companions. Nolan's work on Batman Begins gave true batman fans reasonable insurance that his follow up would be good, but I don't think anyone expected this kind of amazing from a comic. 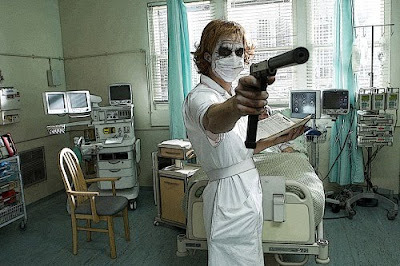 Sadly The Dark Knight marked one of Heath Ledger's final performances. Ledger is everything I could've ever hoped for in a Joker on screen. He gave us a gritty and dark take on the nemesis to Bats, just jaw dropping. I really could go on and on about The Dark Knight, so I'll stop. The movie rules and is always fun to re-watch!